Prime business office location in downtown Tifton! 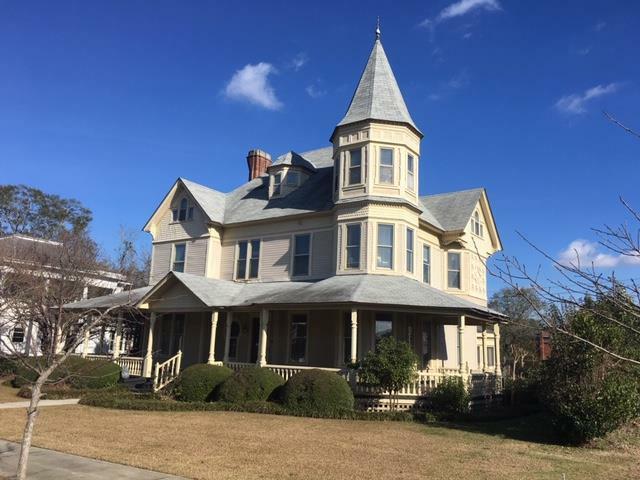 This beautiful 3-story Victorian with over 5, 000 square feet is located directly across from First Baptist Church. The stately interior features one of kind moldings, stairs, doors, and fireplace mantles that have been hand-carved from the very rare Curly Pine wood. The first floor boasts of two conference rooms, a large reception room, two offices, a full kitchen, and one full bathroom. The second floor consists of four offices, two of which have private baths, an additional bath, and two smaller rooms currently used for storage. The third floor contains two bedrooms and two baths. An additional cottage is located out back which comprises of two bedrooms, two baths, a kitchen, and a living room. Also, out back is an extra storage building that has a two-car carport and 10 parking spaces. Additional parking is available on the street in front of the building. This building is elaborate and will WOW your clients!